The text is from the collection, "In deinen Mauern wohnt das Leid" -- inside these walls sorrow lives. Writer and songwriter, Weber was confined to the Prague ghetto by the National Socialists, deported to Theresienstadt, and murdered with her youngest son -- for that is the only word for this -- in Auschwitz. For another of her texts, click here. Sleep, child, forget this world willingly. Nestle you head within my arms. Mother stands guard against all that harms. Sleep, for overnight much will change. peace will have us not forsaken. Copyright © 2017 Gary Bachlund All international rights reserved. Long arches of four-note chords darken a setting as the vocal line declaims its text, a lullaby darkened by the reality of too many mothers and too may children dead by the murderous hands of the National Socialists. From whence then comes peace? Certainly in part through watchfulness against those dark nightmares of reality which would again arise, if they could. 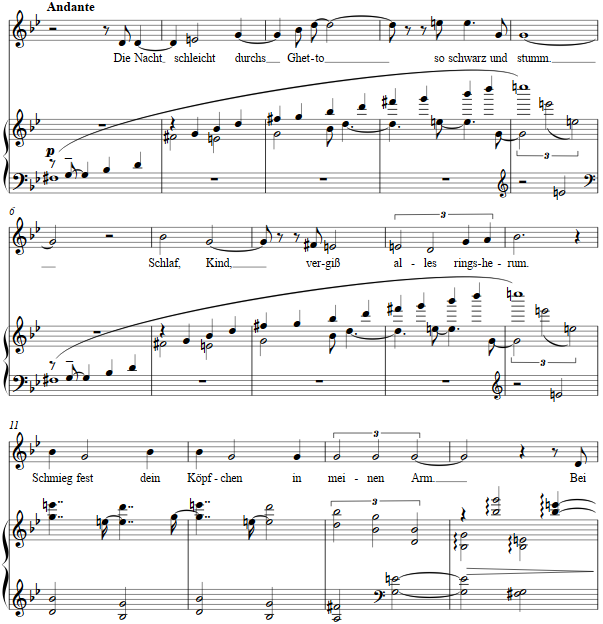 The score for Kleines Wiegenlied is available as a free PDF download, though any major commercial performance or recording of the work is prohibited without prior arrangement with the composer. Click on the graphic below for this piano-vocal score.